The perfect clock for your gameroom or man-cave! 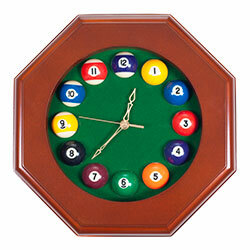 Features a 1.5 inch billiard ball for every hour, and an authentic green felt background. This simple yet classic design is sure to be an attractive addition to any recreation room.